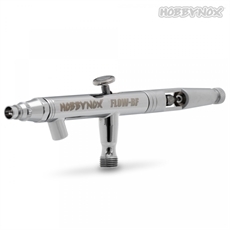 Hobbynox FLOW-BF - Bottom-Feed Double-Action Airbrush Set The FLOW-BF is the perfect first bottom-feed double-action airbrush set that is meant to be used with waterbased non-toxic paints such as our Hobbynox Airbrush Colors or similar from Createx or Parma Faskolor etc. It’s suitable for most types of “larger” airbrush work but painting Lexan bodyshells for RC cars and most medium to larger sized models is what the FLOW-BF excels at. The FLOW-BF is a complete set that is ready to be used and it connects easily to the Hobbynox Airbrush Compressors or any other airbrush compressor that has an G1/8 BSP male threaded coupler. Our optional airbrush color bottle adapter (#HN20000) is the perfect companion to the BF when attaching our Hobbynox Airbrush Color bottles directly to the airbrush!